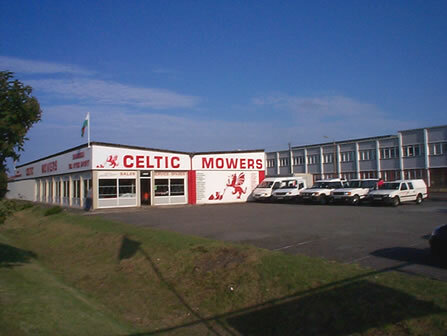 Celtic Mowers Limited are a family company founded in 1970 and situated on a one acre site just one mile from Junction 42 of the M4 motorway on the outskirts of Swansea. Terry & Gary together with their experienced staff are always happy to advise you on your particular Horticultural / Garden Machinery requirements. Over 150 Machines on display, providing the ultimate selection. Machine sales with a care to detail. Largest stockist in South Wales! Supplying to the general public, contractors, councils, golf clubs, hotels, estate managers plus many more. We can source the solution to whatever your particular need is. We pride ourselves in offering 'The Complete Service' for all your grass maintenance requirements. 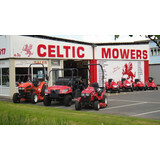 We carry and display over one hundred and fifty models of grass cutting equipment covering a wide spectrum of machine from the small electric mowers to the larger tractors. We are also proud to be Kubota’s silver award winner. We carry the largest range of Grass Machinery in South Wales, able not only to supply all domestic requirements but we also are a major supplier to Public Utilities, Councils, Hospitals, Caravan Parks, Golf Clubs, Hotels Sports Clubs, Hotels and Landscape Contractors. Our Amenity Division can supply all your fertilizers, chemicals, weed killers, golf accessories, grass seed and line marking materials. We naturally provide a superb spare parts and workshop service departments, so rest assured that we will be there when you need us. Terry Flynn - Director. Terry has been with us now since 1988, working through the business to his position today. Terry oversees all aspects of the business & works closely with each department to ensure the business runs as smoothly & efficiently as possible. Gary Evans - Director. Joining the team in 2013, Gary assumes responsibility for the day to day running of the finance function of the business along with assisting in the general day to day running of the business. Emma J Evans - Director. Emma assists in the strategy of the business whilst running her accountancy practice from 2 seperate offices within our Fabian Way site. Danielle Oatley - Finance Assistant. Danielle joined the team in 2018 and assists in the day to day running of the office and administration side of the business. Lee Evans - Parts Assistant. Lee joined the team in 2018 and assists Terry in the day to day running of the stores & spare parts department. Phil Jones - Senior Workshop Fitter. Phil is widely recognised as one of the leading fitters in our sector. He has worked on vast range machines of over the years and is our "go to guy" when we need advice. Phil heads up a successful team of fitters, servicing & repairing our customers machines. If Phil can't fix it then nobody can. Dave Evans - Transport & Logistics. Dave joined the business back in 2007 and is a key memebr of the team. Dave ensures that all the machines are collected & delivered to / from our customers in the most efficient & careful way possible. Workshop & General Duties - The team of Daniel Davies & Denver John have a vast amount of experience between them. Running the day to day operations of the workshop and warehouse, they are a key part of the business. Apprentices. 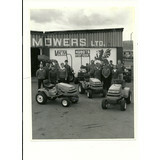 We are proud here at Celtic Mowers to develop & nurture young talent in all aspects of the business. As a long standing, well established South Wales family business we have numerous stories and pictures gathered from 40 years of trading. Over the next few weeks we will update this section of the website, sharing these with you. 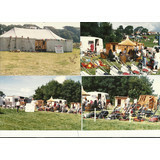 Click on the links below for a trip back through the ages.